Vasily Grigorievich Perov is a famous Russian artist. He made a great contribution to painting. 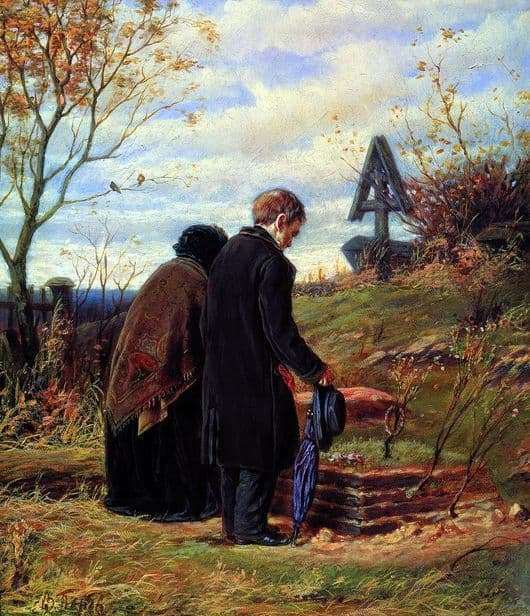 To his creations belongs to the painting “Old parents on the grave of his son,” written in 1874. During his life Perov visited many countries, but most of all he was attracted by France, which later became his second home. It was here that he discovered all his talent as an artist of household painting. Hone his skills, after a few years of being in the capital of France, he returns to Moscow, explaining to his French friends that he wants to understand the soul of man. In search of inspiration, he turned to Russian literature – the works of Turgenev, Dostoevsky, Chekhov and other classics. The canvas “Old parents on the grave of his son” is made in the traditional style of Russian realism. Many critics still tend to that the canvas theme was taken from Turgenev’s work of the same name, Fathers and Sons. The centerpieces of the composition include the old man and the old woman, who came to the grave of her beloved son, who died several years ago, but still loved by these people. The faces of the parents of the child are hidden from the eyes of the spectators, but it is not difficult to guess how they feel. The woman slouched, hid behind her husband from the outside world, to hide all her sadness. The old man looks more resistant, but his unbearable bitterness is shown, no matter how hard she was hidden. This couple looks intently at the grave, and on the face of her husband it is already clear that, after all, humility came to their soul and understanding of what happened. Parents are constantly with the late son, wanting to compensate for all the lost time, which was during his life. In this picture, the artist reproduced as accurately as possible every small detail, with an incredible transmission from each element of his energy and his intention. Perov chose dark tones that do not put pressure on a person, but rather relax and envelop into their space. He does not use changes in design and decoration in order not to distract the viewer’s attention from the deep history of the painting.